On the 8th (Wed), enjoy the sand and surf at Eli Creek and then stroll through Seventy-Five Mile Beach. On the next day, make a trip to K'gari and then contemplate the waterfront views at Indian Head. To find maps, reviews, traveler tips, and tourist information, read our Fraser Island road trip planning tool . San Francisco, USA to Fraser Island is an approximately 26-hour combination of subway, flight, ferry, and car. You can also do a combination of flight, ferry, and car; or do a combination of bus, flight, ferry, and car. Traveling from San Francisco to Fraser Island, you'll lose 18 hours due to the time zone difference. Expect a bit cooler evenings in Fraser Island when traveling from San Francisco in August, with lows around 52°F. 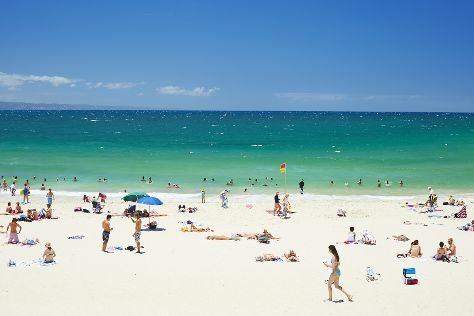 Wrap up your sightseeing on the 9th (Thu) early enough to travel to Noosa. Start off your visit on the 10th (Fri): kick back and relax at Noosa Main Beach, then enjoy the sand and surf at Peregian Beach, and then explore the wealth of natural beauty at Tewantin National Park. To see where to stay, other places to visit, maps, and more tourist information, you can read our Noosa day trip planning tool . Traveling by combination of car and ferry from Fraser Island to Noosa takes 6.5 hours. Alternatively, you can do a combination of car, ferry, and train; or do a combination of car, ferry, and bus. Wrap up your sightseeing on the 10th (Fri) early enough to drive to Gold Coast. Kick off your visit on the 11th (Sat): enjoy the sand and surf at Burleigh Heads Beach, enjoy the sand and surf at Surfer's Paradise Beach, and then enjoy breathtaking views from SkyPoint Observation Deck. On the 12th (Sun), you'll have a packed day of sightseeing: tour the pleasant surroundings at Kirra Beach, kick back and relax at Coolangatta Beach, and then explore the striking landscape of Burleigh Head National Park. To find other places to visit, traveler tips, reviews, and more tourist information, read Gold Coast trip builder website . Traveling by car from Noosa to Gold Coast takes 3 hours. Alternatively, you can take a bus; or take a train. 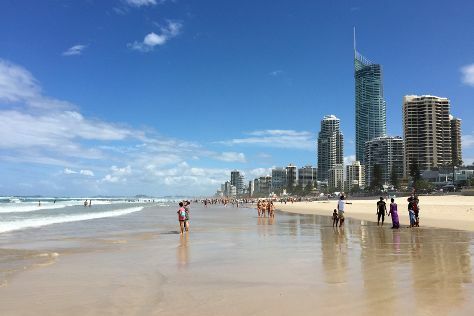 August in Gold Coast sees daily highs of 71°F and lows of 50°F at night. Wrap up your sightseeing on the 12th (Sun) early enough to travel to Port Douglas. On the 13th (Mon), get a new perspective on things with Boat Tours & Water Sports. Here are some ideas for day two: get a new perspective on things with Boat Tours & Water Sports and then stroll through Airlie Beach Lagoon. To see photos, reviews, more things to do, and other tourist information, you can read our Airlie Beach trip planner . You can do a combination of train, flight, and bus from Gold Coast to Airlie Beach in 7 hours. Alternatively, you can do a combination of train, flight, and ferry; or drive. Expect somewhat warmer evenings in Airlie Beach when traveling from Gold Coast in August, with lows around 65°F. Finish your sightseeing early on the 14th (Tue) so you can travel to Cape Tribulation. Start off your visit on the 15th (Wed): look for all kinds of wild species at Daintree National Park. Get ready for a full day of sightseeing on the next day: delve into the lush surroundings at Daintree Rainforest - Cooper Creek Wilderness and then kick back and relax at Myall Beach. To see more things to do, other places to visit, photos, and tourist information, read our Cape Tribulation online trip maker . Traveling by combination of ferry, flight, and car from Airlie Beach to Cape Tribulation takes 10 hours. Alternatively, you can drive; or do a combination of bus, train, and car. When traveling from Airlie Beach in August, plan for somewhat warmer days and about the same nights in Cape Tribulation: temperatures range from 80°F by day to 62°F at night. Wrap up your sightseeing on the 16th (Thu) early enough to travel to Cairns. Start off your visit on the 17th (Fri): take a memorable tour with Tours. Get ready for a full day of sightseeing on the next day: identify plant and animal life at Australian Butterfly Sanctuary, then enjoy the sand and surf at Trinity Beach, and then enjoy the sand and surf at Palm Cove Beach. To see photos, more things to do, and more tourist information, use the Cairns trip itinerary planning tool . Traveling by combination of car, ferry, and bus from Cape Tribulation to Cairns takes 3 hours. Alternatively, you can do a combination of car, ferry, and shuttle; or drive. In August in Cairns, expect temperatures between 80°F during the day and 63°F at night. Finish your sightseeing early on the 18th (Sat) so you can drive to Port Douglas. Start off your visit on the 19th (Sun): discover the deep blue sea with a scuba or snorkeling tour. On your second day here, look for gifts at With Sugar, look for gifts at Coffee Works, then experience rural life at Hartley's Crocodile Adventures, and finally tour the pleasant surroundings at Four Mile Beach. For traveler tips, ratings, and other tourist information, read Port Douglas itinerary planning website . Getting from Cairns to Port Douglas by car takes about 1.5 hours. Other options: take a shuttle; or do a combination of bus and shuttle. In August, daily temperatures in Port Douglas can reach 80°F, while at night they dip to 62°F. Cap off your sightseeing on the 20th (Mon) early enough to travel back home.